For this fortnight's challenge I found this verse in Hebrews 12:2 which I felt would be a good one to have on display in my home for the different friends and family who will be visiting us over this coming weekend. I have placed the heart within the crown of thorns because of the love Jesus displayed as he suffered for my and your sins. 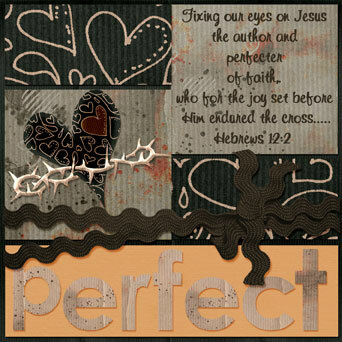 This little digital page was put together using a kit called "Coffee Time" by Digi Illusions. Wow, Anne-Marie, this is gorgeous! I actually did a double-take when I read that is was digital ... it looks so "real"! Great work! Beautiful!!! I love your work so much!! BEAUTIFUL! Love how you pulled this all together and the verse and witness of it is so great! This brings tears to my eyes. Wonderful LO. I need it on my wall.